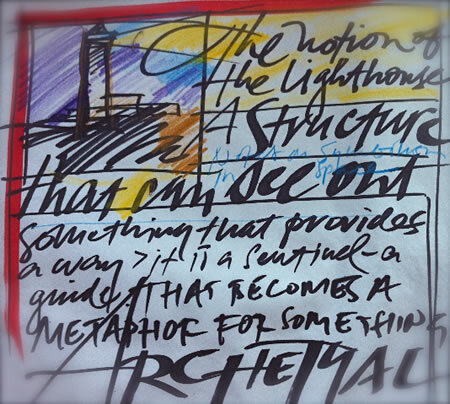 I’ve written and spoken publicly in the past about the concept of the journal — the annotated sketchbook — as a place of making ideas. These days, I tend to write notes in multiple journals — keeping it casual — I’ll even use stapled books, or post-it books of the larger size. In the past, I’ve drawn journals that are gathering places for ideas, as well as project plans and notations. 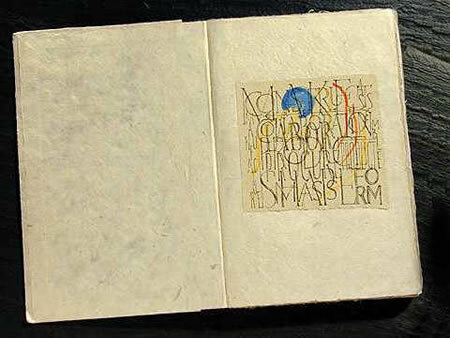 But in a manner, the idea of the journal is less about the actual professional work, and more about the personal work. Working with designers and other creatives, the idea of a journal book is commonplace — but to my observations, they tend to be more about the reflections and notations on a project, rather than the bigger circulations about the nature of the doing of the work. What about the work, the process of action, creatively? 1650s, from Latin, lit. 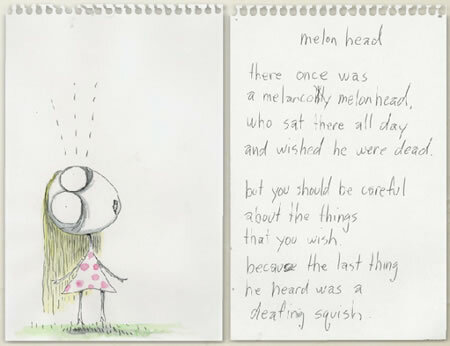 “things to be done,” from neut. pl. of agendum, gerundive of agere (see act). Originally theological (opposed to matters of belief), sense of “items of business to be done at a meeting” first attested 1882.
late 14c., from Old French acte, from L. actus “a doing” and actum “a thing done,” both from agere “to do, set in motion, drive, urge, chase, stir up,” from Proto Indo European root *ag- “to drive, draw out or forth, move” (cf. Greek agein “to lead, guide, drive, carry off,” agon “assembly, contest in the games,” agogos “leader;” Sanskrit ajati “drives,” ajirah “moving, active;” Old Norse aka “to drive;” Medieval Irish ag “battle”). Theatrical (1510s) and legislative (mid-15c.) senses of the word also were in Latin. The verb is first attested late 15c. ; in the theatrical performance sense it is from 1590s. What I am interested in is the relationship between the concept of meditating on the doing — the making — the agenda setting, which becomes a kind of battle to get to the idea — the heart of the ideal that lies deeper in that proposition. Journals can become just that — to the etymological gestures noted above: lead, guide, moving, active — even siege and battlements crossed. While I’ve not worked with Guillermo Del Toro, I set that as an dream. 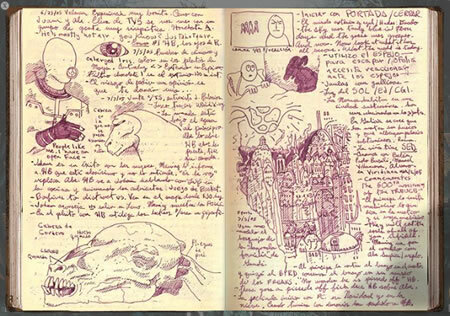 I first heard of the journals of Mr. Del Toro in reading a British paper (for a story in LA) about how he left the design book for his production of “Pan’s Labyrinth” — an extraordinary venture of imagination — in a taxi. 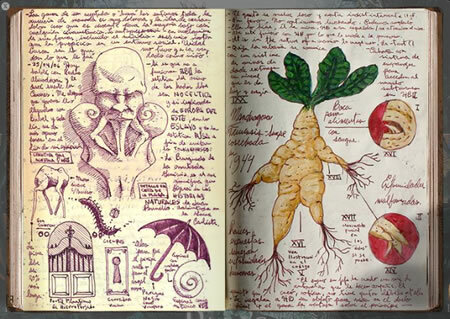 Guillermo del Toro put all his ideas for `Pan’s Labyrinth’ in a notebook — then lost it. THE heavyset man ran down the London street, panting, chasing the taxi. When it didn’t stop, he hopped into another cab. “Follow that cab!” he yelled. Guillermo del Toro wasn’t directing this movie. He was living it. And it was turning into a horror tale. Unlike in the movies, though, Del Toro couldn’t catch the taxi. Visits to the police and the taxi company proved equally fruitless. Del Toro’s films — “Chronos,” “The Devil’s Backbone,” “Blade II,” “Hellboy” — typically feature magical realism. Fate was about to return the storytelling favor. The cabbie spotted the misplaced journal. 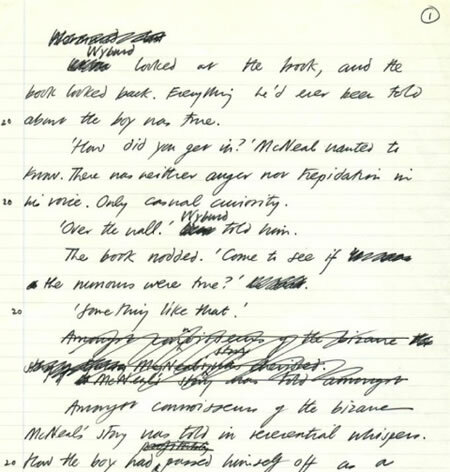 Working from a scrap of stationery that didn’t even have the name of Del Toro’s hotel (just its logo), the driver returned the book two days later. An overwhelmed Del Toro promptly gave him an approximately $900 tip. 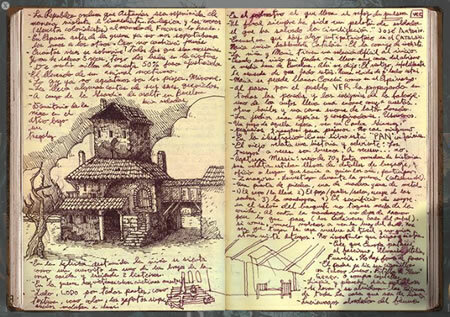 The sketches and the ideas in that misplaced journal — four years of notes on character design, ruminations about plot — were the foundation of “Pan’s Labyrinth,” a child’s fantasy set in the wake of the Spanish Civil War. The director, who at the time wasn’t even sure he’d actually make “Pan’s Labyrinth,” took the cabbie’s act as a sign. He plunged into the movie. Mexico’s submission for the foreign language Oscar opens Dec. 29. The concept of the journal as a working place — a point of gathering — a gazement, is something that is disappearing — with literary strategists like Neil Gaiman, their journals are blogs. Dave McKean, his partner in an entire grouping of projects, mentions that he’s too busy to focus on his site. 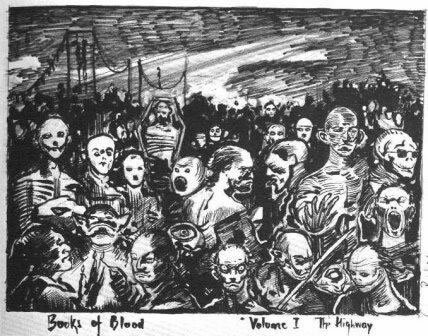 Or, the illustration of his journals, though the collected ideas or the sketchbooks of McKean’s work would likely be extraordinary. 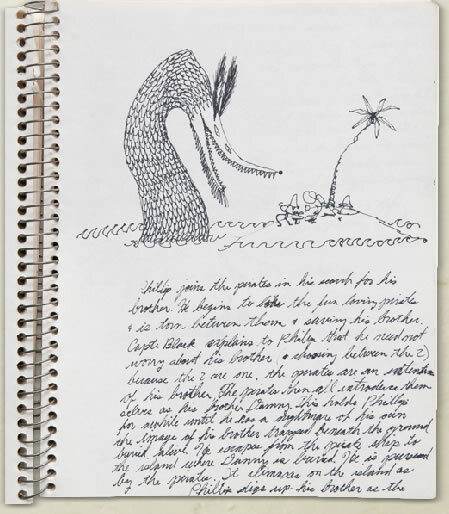 Guillermo Del Toro has one grouping of his journals, which are accessible online — these are an interactive feature of the PictureHouse site. 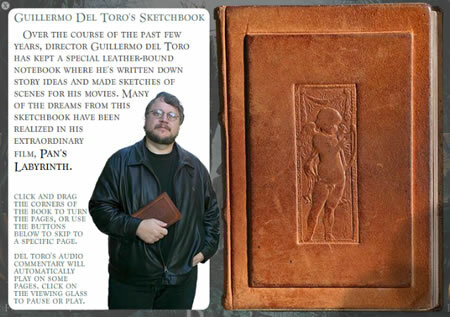 The added delight is Del Toro’s remarks, including a gesture to losing his journal. The delight is enhanced by the character of his observations — if you’ve ever studied any of his films with his commentary in play — he’s got a great sense of humor. In addition to Tim Burton, and the notion of the journal place, in working with Clive Barker, on the identity conceptions for some of his films. 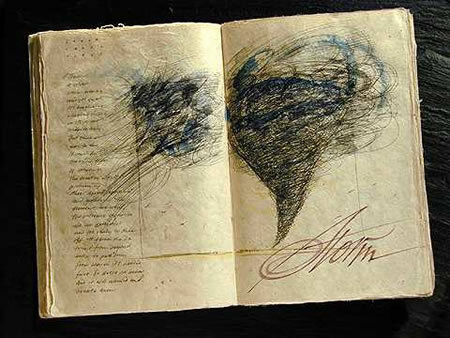 There too, in the Barker’s journaling notations, creative conceptions culminate in production, storytelling and stretching the realizations of the visioning. Barker’s tapestry, as a writer and illustrator, is extraordinarily broad reaching. Even working with Tom Cruise, or director Tony Scott, JJ Abrams, David Fincher, I’ve often sorted through sketches of storyboards and related materials to finalize approaches for design. 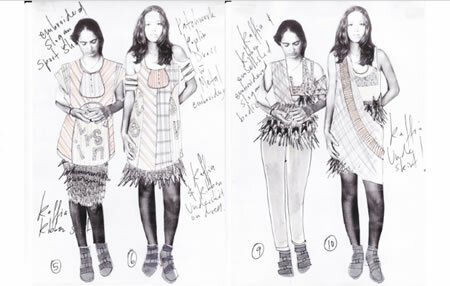 What of the composite drawings in other forms of design – fashion, for example? 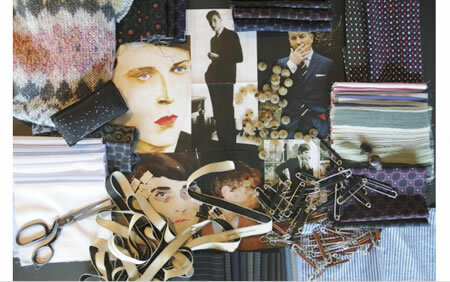 That range of creative development hits the street in a new collection of fashion designer’s sketchbooks, linked-in the notations of Nowness, and the researches of a lecturer at Central Saint Martins, ex-editor of Sleazenation, Hywel Davies. That idea of art, exploration — seasonal or otherwise — it’s an intriguing path to the examination of content – if you’re on the path to finding something, discovering that renewed edge, walking the perimeter of the work — how do you get there? 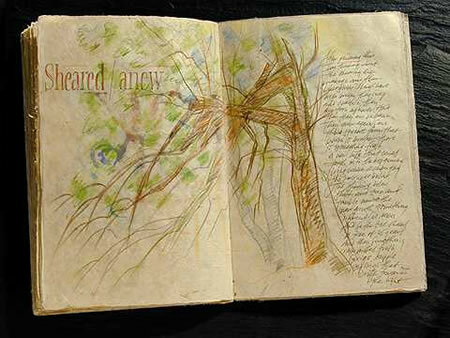 What’s the point of the effort taken, the journal / journey wandered. Going out there, I’m looking for what could be found, what could be discovered, beneath that surface. Word labyrinths and storm gathers: what’s in the word, what storm is coming? I’m sure that you’ve got ideas about your concepts of journals as a creative place, that goes well beyond notetaking and project documentation — a place where you explore the deeper side of the agenda — the work of design. A gesture to that work, my use of the journal as a deeper investigation of the meaning of what’s being done, what shall be done — what’s the story, who’s telling it, and why is it worth telling? What mark, on the cover of the story? RAVENS, TOM FORD, EYEWEAR AND BRAND MYTH: THE LEGACY OF THE CORVID IN RETAIL BRANDSTORY AND MERCHANDISING. Design Leadership Principles of Steve Jobs and the Apple Empire: The Twelve Steps of Design Discipline.